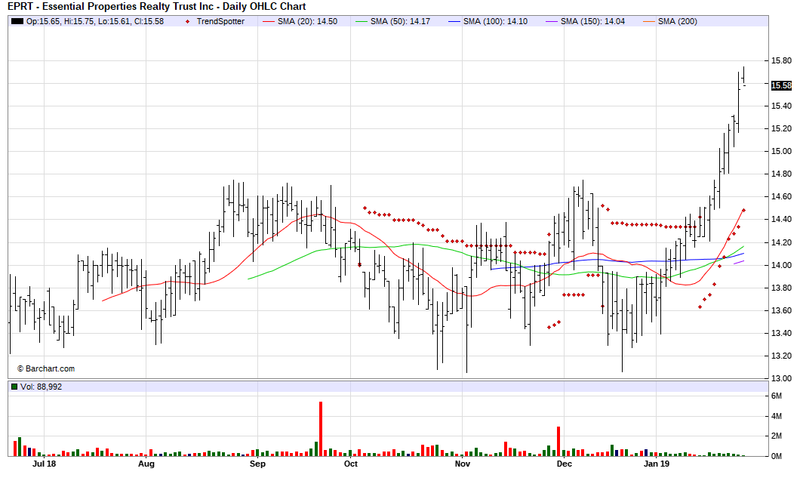 The Barchart Chart of the Day belongs to the REIT Essential Properties RealtyTrust (EPRT). I found the stock by sorting Barchart's Top Stocks to Own list first by the most frequent number of new highs in the last month, then used the Flipchart feature to review the charts for consistent price appreciation. Since the Trend Spotter signaled a buy on 1/16 the stock gained 7.45%. Essential Properties Realty Trust, Inc. is a real estate company. It owns, acquires and manages single-tenant properties which are net leased on a long-term basis to service-oriented and experience-based businesses. The company serves restaurants, car washes, automotive services, medical services, convenience stores, entertainment, early childhood education, health and fitness sector. Essential Properties Realty Trust, Inc. is based in Princeton, New Jersey.